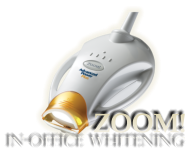 Tray whitening is our office’s preferred method of whitening because patients have more control over the shade they are trying to achieve. In tray whitening, an impression is taken and a custom tray is made for the patient. Then, a supply of whitening gel is given to the patient and he/she wears the tray for a few hours each day (techniques differ) for a period of time until an acceptable result is achieved. Sensitivity of the teeth is a normal side-effect of this whitening method and is almost always transitional. If you have any questions about teeth whitening and cosmetic dentistry and you live in or around Rochester, give us a call today!